Overhearing Jesus’ question to Philip, Andrew added, “There is a lad here who has five barley loaves and two small fish, but what are they among so many?” Andrew’s mind went to available resources. John, writing years later about the incident, describes Jesus’s question as a “test.” But what was the test? To see who could whip out their iPhone and locate the nearest market? To see who could most quickly calculate the cost? To see who could conduct a speedy inventory of personal resources and accounts? Jesus has been preaching, teaching, and healing – both proclaiming the ruling power of God and demonstrating it – and sowing absolute truth into their minds. Now presented with an impossible situation, Philip must apply what he has been taught. The test exposed the inner working of Philip’s thought life under stress. We say we are trusting Him, but our thoughts tell the real story. Under pressure and experiencing anxiety, Philip’s mind didn’t run to the Father who is the King of kings. He stopped at the walls erected by a worldview chained to the physical senses, but blind to an unseen, spiritual realm. 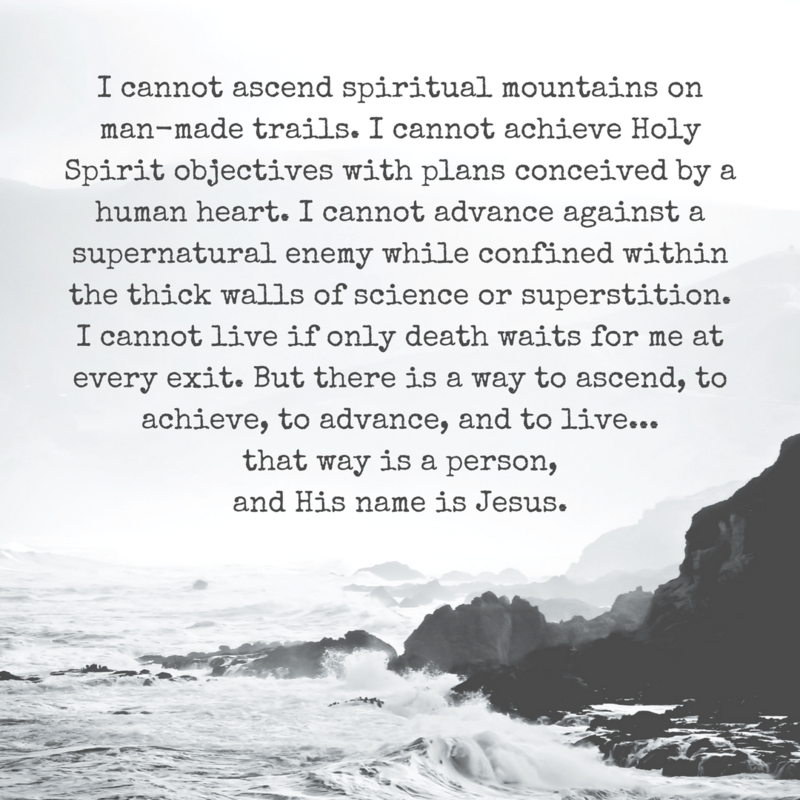 He slid off into a mental pit of self-reliance, rather than rest in the unseen, almighty God. The Old Testament is full of examples of kings who failed to trust God when confronted with vastly superior military threats. They ran and forged alliances with other nations, placing their faith in the popular, collective wisdom of their generation for deliverance. Over and over again, God allowed His people to discover the hard way that He is the rock, the hiding place, and the refuge in the midst of overwhelming problems. They were being tested. Jesus simply took what was available, lifted it up to His Father, and said “thank you.” And everything changed. When tested, the problem-solving disciple has disciplined his mind to go first to the Father. Only in His Presence can we see the truth about ourselves and our problems. One year after Gail and I moved from California (1988), the Los Angeles Times reported that a young woman had been trapped in her car after falling asleep at the wheel just after midnight on a Saturday morning. The car had plunged through a guard rail and was dangling by its left rear wheel. Several motorists stopped, grabbed some ropes from one of their vehicles, tied the ropes to the back of the woman’s car, and hung on until the fire units arrived. A ladder was extended from below to help stabilize the car while firefighters tied the vehicle to tow trucks with cables and chains. “Every time we would move the car,” said one of the rescuers, “she’d yell and scream. She was in pain.” It took almost three hours for the passers-by, California Highway Patrol officers, tow truck drivers, and firefighters – about 25 people in all — to secure the car and pull the woman to safety. Created to live in relationship with Him, we have all run away. Designed to live with others by reflecting His love and mercy, we formulate our own ideas about how to live with people, leaving broken hearts and emotional debris in the wake of our selfishness. Endowed with a heart where God can come and commune with us, we have chosen to blockade the doors, denying God access to our hearts, darkening the windows of our souls, and becoming empty caricatures of humanity. Hanging from a very brief thread of physical existence, we disparage and disregard the only God out there who is listening. The result? There’s no hope in that scenario… we are condemned already. But, in spite of everything we have become… everything we have said… and everything we have done… He loves you and me. What was the Jesus doing entering this world as a baby in Bethlehem? It was a rescue mission. He was coming after us. The goal? To keep you from perishing… to give you everlasting life. We can keep reassuring ourselves and one another that we can do it ourselves. Or we can believe in Him, surrender control, and rely completely on Him and not ourselves for getting through this life. Saved from certain disaster. Saved to be enveloped by His love and inhabited by His life. Not so bad… considering where you’re hanging from right now. I thank God for rescuing me. He is my Christmas Revolution. Is He yours? At the heart of the conflict described in John 8 was Jesus’ relationship to His Father. “I am not of this world,” He told them (verse 23). Jesus explains that He “came from God” and that God “sent Me” (verse 42). What did He teach? “I speak to the world those things which I heard from Him” (verse 26). Then and now, Jesus’ clear statements about Himself are reinvented, restated, reinterpreted, or rejected, but rarely are they taken at face value. They are revolutionary, and for most people, they are unacceptable. they challenged His authority – “Now we know that You have a demon! Abraham is dead, and the prophets; and You say, ‘If anyone keeps My word he shall never taste death.’ Are You greater than our father Abraham, who is dead? And the prophets are dead. Whom do You make Yourself out to be?” (verses 52-53). But religious debate turned into attempted murder when Jesus said, “before Abraham was, I AM” (John 8:58). This was a bold declaration of deity. “I AM” was a reference to the sacred and holy name of God, “Yahweh” (Exodus 3:13-15). Hearing what they believed to be blasphemy, the deeply offended crowd picked up stones… the conversation was over, and Jesus walked away unharmed. How’s your conversation with Jesus going? In the midst of an all-out attack on Jesus, His opponents brought up the well-known question about Jesus’ paternity. “We were not born of fornication,” they said (verse 41). It was a cheap shot. Mean. Hurtful. Almost no one had believed Mary’s story how she had become pregnant through the Holy Spirit, but Jesus knew the truth about Himself (Luke 1:21-38). The problem was that these men didn’t know the truth about themselves. Claiming to know God as “Father,” they missed God. Completely. Drop the stones. Stop challenging Him and dissecting Him… just listen to Him: “If God were your Father, you would love Me,” He said (verse 42). When you are dealing with the one, true God of the universe… you will fall in love with the baby born in Bethlehem. It’s that simple. And it’s an inescapable reality within the Christmas Revolution. In the popular reality TV show “Undercover Boss,” CEOs go to work as ordinary people within their own companies. Subject to the same income, policies, and managers as the other workers, the CEOs are often motivated to make leadership changes and provide special assistance to the employees they befriended during their undercover experience. When an overbearing supervisor unknowingly mistreats or speaks harshly to the CEO-in-disguise, viewers begin to look forward to the moment when the true identity of the CEO is revealed. What is Christmas really about when you peel away the myths and legends, gift-buying and giving, and holiday customs and social gatherings? It’s the story of the time when the CEO of the universe went “undercover” among us. The timeless and eternal God stepped down quietly out of eternity and slipped into our neighborhood. Entering our time and space as the baby Jesus, he emerged as the Lord of Lords, and the astounding story of His visit continues to be told and re-told through the ages. Carrying out a divine rescue mission with a human heart pounding with love, He chose to come. And for those of us who know Him, He walks with us still. His birth was the beginning of a revolution. A revolution represents a radical change in something. Over the next 25 days leading up to Christmas, I want to point out the revolutionary nature of our sacred celebration.